Showing 1 - 20 of 495 results. A photograph of a security guard wearing a high-visibility vest. 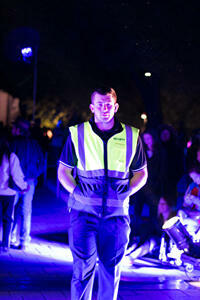 The security guard is in Cathedral Square during the Canterbury Tales procession. 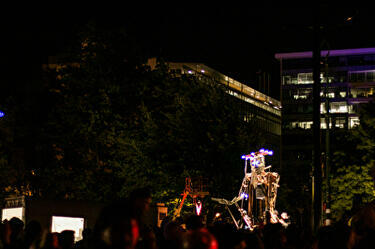 Canterbury Tales was created by Free Theatre Christchurch, and was the main event of FESTA 2013. A photograph of a musician performing during the Canterbury Tales procession. 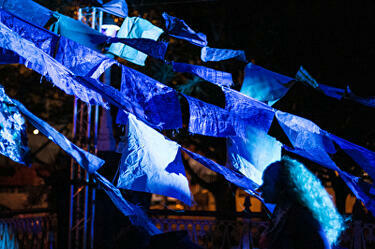 Canterbury Tales was created by Free Theatre Christchurch, and was the main event of FESTA 2013. A photograph of a Canterbury Tales performer in Cathedral Square. 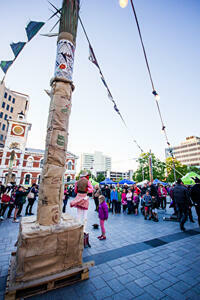 Canterbury Tales was created by Free Theatre Christchurch, and was the main event of FESTA 2013. A photograph of one of the large-scale puppets titled The Friars. The puppet is in the Canterbury Tales procession. 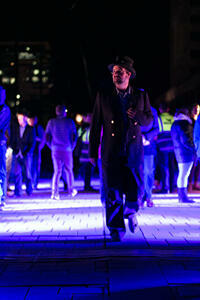 Canterbury Tales was created by Free Theatre Christchurch, and was the main event of FESTA 2013. 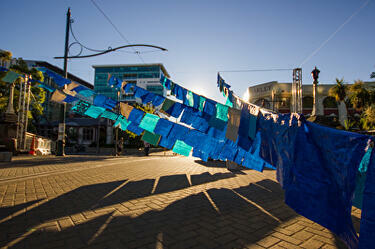 A photograph of an installation of blue tarpaulin flags on the Worcester Street bridge. The installation, titled Eye of the Storm/em>, was created for Canterbury Tales by students from the School of Design at the University of Technology Sydney. 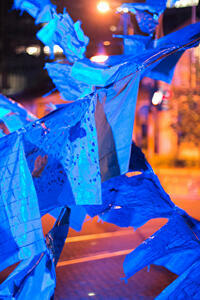 Canterbury Tales was a carnivalesque procession and the main event of FESTA 2013. A photograph of a performer suspended in a harness above the base of the Robert Falcon Scott statue, during a rehearsal for a performance titled Angel of History. 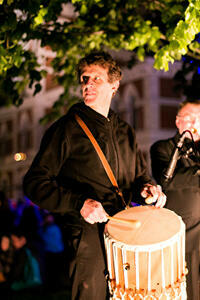 The performance was part of Canterbury Tales - a carnivalesque procession which was the main event of FESTA 2013. 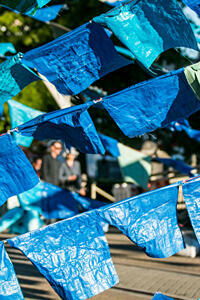 A close-up photograph of an installation of blue tarpaulin flags on the Worcester Street bridge. The installation, titled Eye of the Storm, was created for Canterbury Tales by students from the School of Design at the University of Technology Sydney. 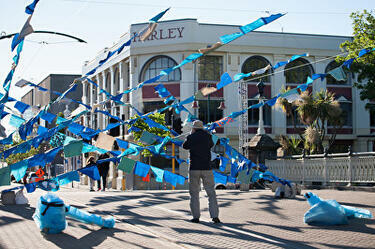 Canterbury Tales was a carnivalesque procession and the main event of FESTA 2013. A photograph of a performer suspended in the air by a harness during a rehearsal for a performance titled Angel of History. A photograph of puppets and masks being constructed in the Free Theatre warehouse space on Lismore Street. 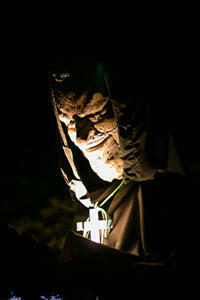 The puppets and masks will be used in the Canterbury Tales procession. 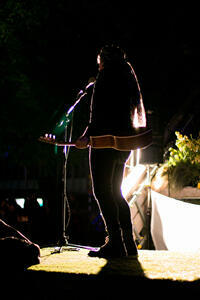 Canterbury Tales was created by Free Theatre Christchurch, and was the main event of FESTA 2013. A photograph of one of the operators of a large-scale puppet titled The Merchant. 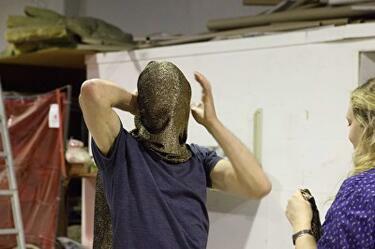 The operator is putting on part of the costume, in the Free Theatre warehouse space on Lismore Street. 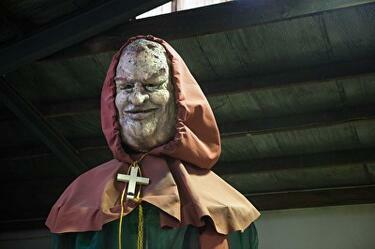 A photograph of the head of one of the large-scale puppets titled The Friars. The puppet is in the Free Theatre warehouse space on Lismore Street. 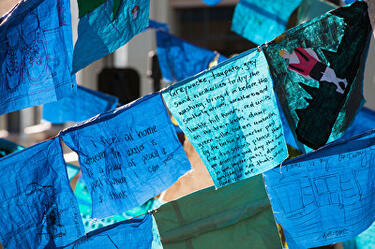 A photograph of a market in Cathedral Square, as part of Canterbury Tales. 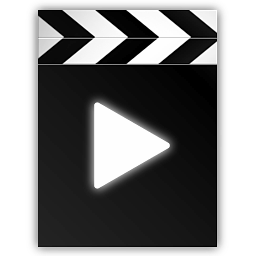 A crowd has gathered around a mime who is standing on a box to perform. 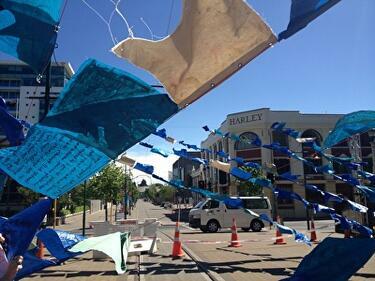 Canterbury Tales was a carnivalesque procession and the main event of FESTA 2013.